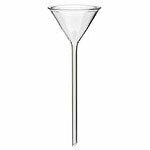 NETA Scientific supplies a broad range of laboratory funnels and accessories such as weighing funnels, buchner funnels, and separatory funnels for your liquid and chemical applications. We distribute lightweight and durable funnels built from laboratory-grade materials. Browse our selection from top manufacturers.